“As we approach the fourth anniversary of Superstorm Sandy, it is absolutely critical that we do all we can to understand and respond to the real threat that climate change poses to the Jersey Shore and other low-lying communities throughout our state,” said Sen. Menendez. 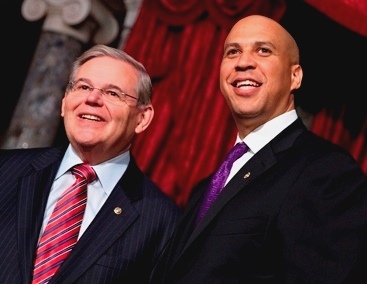 Newark, NJ, December 11, 2014 ― Steve Adubato’s one-hour interview with US Senators Robert Menendez and Cory Booker aired Wednesday on PBS and via streaming at NJ.com. On the topic of the Affordable Care Act, while supportive of the overall act, Sen. Booker acknowledged (at 36:50) there was room for change. Newark, NJ, April 22, 2014 — Government and industry leaders today gathered at the New Jersey Institute of Technology (NJIT) to join NJIT President Joel S. Bloom for the launch of the New Jersey Innovation Institute (NJII), an NJIT corporation that provides a new model for business innovation through the leveraging of industry, government, and higher education assets and investment. U.S. Senator Cory Booker, Panasonic Corp. of North America Chairman and CEO Joe Taylor, New Jersey Lieutenant Governor Kim Guadagno, New Jersey Secretary of Higher Education Rochelle Hendricks, and New Jersey State Senator Raymond Lesniak attended the NJII event and discussed the importance of the venture as well as its potential to facilitate economic development through the marriage of industry-driven agendas and NJIT’s intellectual and technological assets.